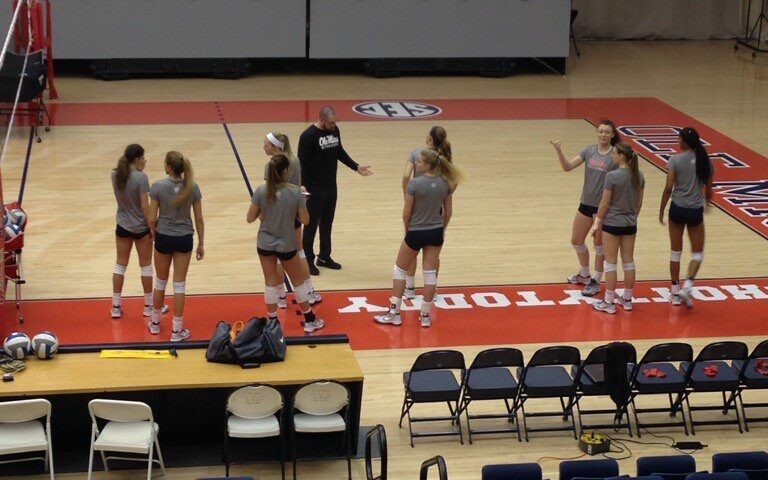 OXFORD – After the Ole Miss Volleyball team’s final spring competition Saturday afternoon at home against Missouri State, Rebels’ head coach Steven McRoberts pointed out one thing he wants to see more of in the fall: consistency. Ole Miss lost the first set, 32-30, then lost the next three out of four to the Bears. After the fifth set – which Missouri State won 15-9 – McRoberts had a long talk with his team and explained that he hopes they will use the next three months to work hard and set the tone for the six incoming freshmen who will be arriving in July. With a mixture of star returnees and highly-touted incoming freshmen, the future is indeed bright for the Rebels. Ole Miss lost three players from last year’s team that finished 22-11, overall, and 8-10 in league play. In addition to the six newcomers, the Rebels have 11 returning members on a team that posted consecutive 20-win seasons for the first time in three decades—and notched a school-record 13 home wins. We know what we have to work on, and that’s what you want when you go through the spring—to figure out what your strengths are, where your weaknesses are and know what your game plan is going into the fall. Some of the positives McRoberts noted were the net attacks of junior middle blocker Taylor Alexander, junior outside hitter Kate Gibson and sophomore right side hitter Kathryn Cather. McRoberts also saw moments when the Rebels exhibited solid ball control and passing, as well as an aggressive defense. However, no player has yet solidified a starting position and the head coach made it clear all spots are up for grabs. “In the first week of the spring, I said ‘You’ve got three months to perform in front of the coaches that the freshmen who are coming in won’t have, so work hard to make it hard for us. Make it where as we are going into the summer, we are thinking: ‘Okay, we got the group,’” McRoberts said. “So, I’m hoping this group will take that to heart and come in over the summer and work their rears off to get better,” he added. McRoberts readily acknowledges he has a talented group of freshmen coming in, but he is not sure how quickly they will adapt to the speed of Division I volleyball. 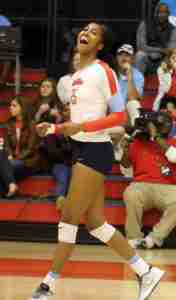 Three of the Rebels’ incoming signees were tapped by PrepVolleyball.com for their outstanding senior seasons. Fairview, Texas native Jordan Fate, a 5-foot-9 setter, was one of 150 players named to the All-American list for the second year in a row. Tate was also named an AVCA Under Armor Honorable Mention All-American in 2015. She ended her high school career at Lovejoy High School earning Texas Girls Coaches Association All-State honors for the second-consecutive season and being named to the State All-Tournament Team after leading the Leopards to a runner-up finish in the Texas State High School 5A Championships. PrepVolleyball.com also recognized Kansas natives Emily Engelken and Nicole Purcell as honorable mentions. Engelken, a 6-0 outside/right side hitter from Overland, Kansas, guided Blue West High School to the 6A State Championship in 2015, finishing with a record of 40-4. Engelken was named to the 6A All-State First Team. Purcell, a 5-9 defensive specialist from Leawood, Kansas, guided Bishop Miege High School to its third-straight state title in 2015. She was named to the All-State Tournament Team as well as the 4A Division 1 All-State First Team. From the looks of all the incoming talent, McRoberts and staff will face some tough decisions in figuring out who will be on the court for the Rebels in the fall. We have a good group of freshmen coming in and we are confident in them. We are confident in this current group, too. But, from a culture and mentality standpoint, we are going to have to get tougher. As the Gillom Sports Center was clearing out, McRoberts was asked how comfortable he would be if he had to play all freshmen next season. “It would be hard for me to believe that all six would be out there, but it wouldn’t be hard for me to believe four of them could be out there,” McRoberts said. The Rebels will play the 2016 season in The Pavilion, as the Gillom Sports Center undergoes a renovation beginning at the end of May. The Red and Blue Scrimmage is set for August 24, and the Magnolia Invitational runs August 28-September 1 in Oxford.